here is the program Händelfestspielprogramm. Johann Sebastian Bach (1685-1750) was a court musician for a full 15 years of his professional career: first of all as organist and concertmaster in Weimar (from 1708), then as kapellmeister in Köthen (1717-1723), municipal music director in Leipzig, kapellmeister to the Duke of Weißenfels 1729, and from 1736 court composer to the electors of Saxony Dresden. In short: the appeal of the works of Bach, court composer, lies in their extreme diversity of form and genre. The Bachfestival 2019 will be aiming to bring out the "courtly" side of Bach's oeuvre - in four series devoted to his works in Weimar, Köthen, Dresden and Berlin. Enjoy a BACHFESTIVAL Leipzig 2019 of particular diversity ! Allow yourself to be pampered by good, best view and seating within a price range: in churches, concert halls, on public stages and a good choice of hotel accommodation within the pedestrian area to handsome and secure prices. "THE BIG FIVE" were called by big-game hunters for certain animals on Safari-Tours in Africa. They were hunted not only in the first place because of their tallness, but mainly because of their difficult hunting methods and dangerousness. 1. Johann Sebastian Bach, one of the most brilliant composers in history, living in Leipzig from1723 to 1750. 2. Thomaskirche Leipzig - 800 years Church, School and Boy's Choir. 3. Nikolaikirche - most beautiful and biggest church in Leipzig, starting point of the Peaceful Revolution 1989. 4. Museum in the "Round Corner" - contemporary history in original rooms; how the DDR-citizens overcame their secret police "STASI". 5. Gewandhaus -250 years world-wide top orchestra; the 3 rd building since their foundation in 1743 with impressive architecture, acoustics and exciting famous history. Johann Sebastian Bach in Leipzig - special. "We know very little abaout Bach's life. There are only a few facts to go on and our image of him is skewed by statues and paintings of a stern forbidding figure in a frock coat and a powered wig. Take a stroll on the big impressive Christmas Market ! Martin Luther (middle) of church window of St.Thomas Church Leipzig; right hand: prove of Luther's first sermon there. In spite of Luther's feeling of doom regarding the immorality of Leipzigs City life, Leipzig as a town of trade fair and a vivid centre of university and spirital life, it has developed into an important economical and intellectual centre: the spirit of reformation, the tradition of free thinking and acting has held on its effects on the 'PEACEFUL REVOLUTION' 1989 in Leipzig. for € 150 per pers. Experience a weekend or a few days - put together your own highlights ! Experience a long weekend and the 150th anniversary on the trails of historical places of the SPD (Social Democratic Party of Germany )the peacefully reunification of Germany (1989 Nikolaikirche), J.S.Bach and other great events, also by bike possible. A free dating is also possible. 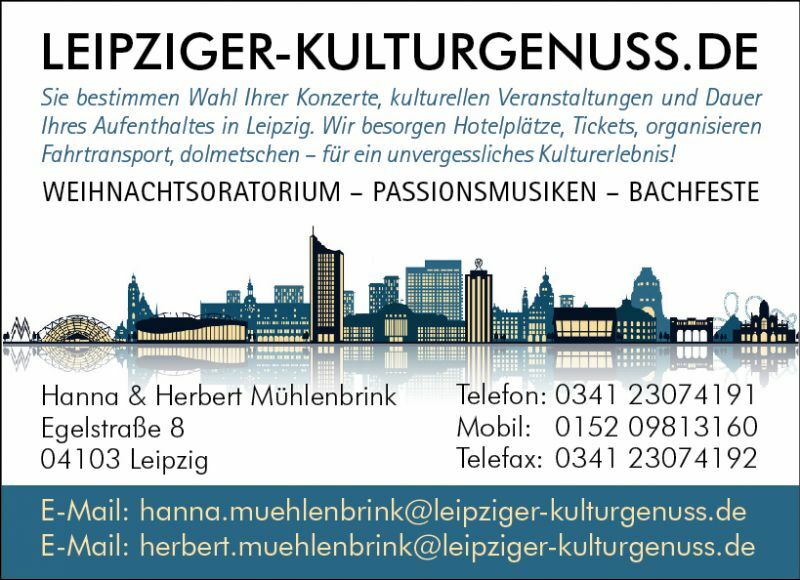 And have you ever heard of Leipzig - Musikstadt von Welt (Leipzig as one of the most important 'Town of Music' where all developed thorughout the centuries since Johann Sebastian Bach (1685-1750).